We've got a big, beautiful share this week for our CSA members this week! The last of our summer squash and slicing cucumbers this week, and we may have seen the last of our green beans last week. 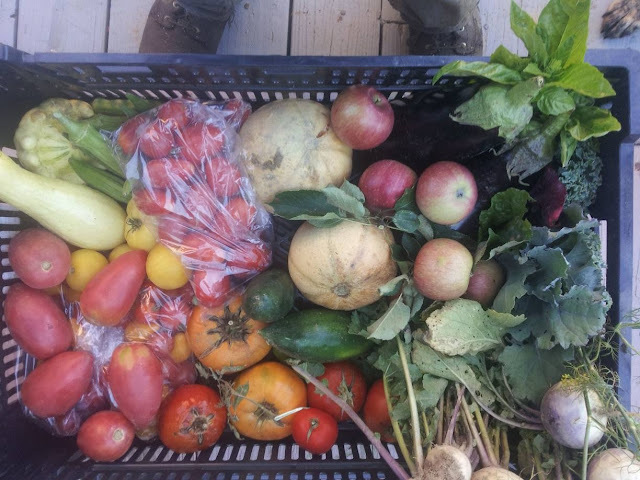 More okra, green onions, turnips, kohlrabi, jalapeno, herbs (basil and dill) and a bunch more apples as well! Our tomatoes are reaching their peak, and this week we have ALOT of tomatoes for everyone! Cherry, pear, roma, peach, and slicers for everyone! New this week are the first of our Eggplant for our full shares as well as the first of our melons, a french heirloom cantaloupe variety called Charentais. Believed by many to be the most "divine and flavorful melon in the world", it's a small grapefruit sized melon, perfect for sharing with another for dessert! Full Share Pictured: 2 Melons, 2 Summer Squash, 2 cucumbers, 10 Apples, large bunch of turnips, 2 Eggplant (Full share only), 2 Heirloom Slicer Tomatoes, 4 Red Slicer Tomatoes, 6 Heirloom Romas, 4 Peach Tomatoes, 2 lbs of Romas, 2 lbs of assorted cherry and pear tomatoes, 8 okra, 2 jalapenos, 2 kohlrabi, large bunch green onions, italian basil and dill! New this week are the first of our melons! This week it's a french heirloom cantaloupe called Charentais. Sweet, juicy orange flesh with a heavenly fragrance, sharing one of these desert melons with a loved one is a perfect way to end a late-summer day. They are generally about the size of a grapefruit, about 2 lbs. New this week special for our full shares are the first of our Eggplant (in the upper right hand corner of the picture). Eggplant is in the same family as tomatoes and potatoes and was first domesticated in India. We have the large black Italian variety, perfect for ratatouille or eggplant parmesan. Raw eggplant can have a somewhat bitter taste, but become tender when cooked and develops a rich, complex flavor. The flesh is smooth and meaty, capable of absorbing large amounts of cooking fats and sauces, making for very rich dishes and making it a great meat substitute for vegan and vegetarian dishes! Our tomato plants are heavy with ripening fruit for everyone to enjoy this week! More peppers this week! You'll find either Jalapeno or a Poblano pepper in your shares this week. We always like to use jalapenos in our salsa or guacamole. But we also experimented with adding diced Okra and Jalapeno to our favorite Cornbread recipe and were delighted by the result! For the poblano pepper, try heating up some macaroni this week with this Green Chile Macaroni recipe. Our summer squash are winding down, and this may be the last share they'll be in. The Yellow Crookneck and Scallop squash are still producing, so try sauteing or grilling these squash. We have more apples for everyone this week, 10 per share! These apples are still a bit tart, which means they are PERFECT for apple pie. So check out our Sour Cream Apple Pie recipe and prepare to have every other pie for the rest of your life seem just ok. This week we have more italian basil and dill! Enjoy the dill on a cucumber sandwich with the last of the slicing cucumbers. Try making some bruschetta or caprese salad with the Italian basil. You can always dry your herbs in a dry, well-ventilated area and use later!